To Cite: Ebrahimpur M, Gohari Moghadam K, Pejman Sani M, Naderpour Z. Knowledge, Attitudes and Practices of Internal Medicine Residents Towards Deep Vein Thrombosis Prophylaxis in a University Hospital in Tehran, Shiraz E-Med J. 2016 ; 17(12):e39038. doi: 10.17795/semj39038. Background: Deep Vein Thrombosis (DVT) is a major problem in hospitalized patients. There is discrepancy between healthcare providers’ knowledge and their clinical practice regarding DVT prophylaxis. In this study we aimed to evaluate knowledge, attitude and practices of internal medicine residents at an educational hospital in Tehran. Methods: This cross-sectional study was conducted during December 2015 at Shariati hospital of Tehran, IRAN. A questionnaire covering five domains of clinical scenarios, adherence to guidelines, personal beliefs, practice, preferences and personal beliefs, was distributed between internal medicine residents. Medical records of patients at the internal ward were reviewed to assess the status of DVT prophylaxis in patients, who needed DVT prophylaxis based on American college of chest physicians’ (ACCP) guidelines. Results: Overall, 71 residents out of 88 residents returned the questionnaire, and 43.7% were aware of the guidelines. Furthermore, 97.2% thought DVT prophylaxis is clinically important but only 66.90% of the patients, who needed DVT prophylaxis, were receiving DVT prophylaxis. More than 50% of the residents underestimated the incidence of DVT and mortality rate due to pulmonary embolism. The most common reason for not prescribing DVT prophylaxis was concern about bleeding in 53.5% of the participants. Further analysis of different components of the questionnaire showed that there is a significant association between “awareness” and “adherence” scores (P = 0.041) and correct answers to “clinical scenarios” and “practice” (P = 0.012). Conclusions: Although the level of knowledge on these clinical situations is good, underestimation of the risk of DVT development in hospitalized patients needs more attention. This might be due to low levels of awareness of presence and content of DVT prophylaxis guidelines. Programs should be designed to uphold the levels of information of DVT prophylaxis guidelines among internal medicine residents. Deep vein thrombosis (DVT) and pulmonary embolism (PE) together comprise the most common preventable cause of hospital-related death, known together as venous thromboembolism (VTE) (1). Approximately, 35% of patients with symptomatic VTE present pulmonary embolism (PE), while 65% of patients manifest only deep vein thrombosis (DVT) (2). DVT is a relatively common situation carrying serious consequences. Hospitalized patients encounter greater risks for DVT. About 25% of all cases of venous thromboembolism finally lead to hospitalization (3). Despite continuation of anticoagulant therapy after VTE occurrence, VTE recurs commonly in the first few months after the primary event, with a recurrence rate of nearly 7% at 6 months (4). Death occurs in approximately 6% and 12% of DVT and PE patients within 1 month of diagnosis, respectively (5). While some studies suggest “no intervention” regarding DVT prophylaxis in hospitalized patients, review studies are in favor of conducting interventions (6). Studies have been conducted to figure out the reason for this discrepancy between the actual rate of patients in need of DVT prophylaxis and the actual rate of DVT prophylaxis prescription in practice. A study by Vardi et al. (7) showed that three main reasons have been associated with this problem, including underestimation of VTE risk, lack of formal prophylaxis programs and lack of interest. The aim of the current study was to assess internists’ attitude towards VTE prophylaxis, by considering their awareness and adherence to clinical guidelines, treatment preferences and personal beliefs. This cross-sectional study was conducted during December 2015 at Shariati hospital of Tehran, Iran. The aim of this study was to evaluate knowledge, attitudes and practices of internal medicine residents toward DVT prophylaxis in hospitalized patients. A questionnaire obtained from Vardi et al.’s study (7), titled “attitudes towards and practice of venous thromboembolism prevention in general internal medicine wards: a multinational survey from member countries of the European federation of internal medicine”, was distributed between internal medicine residents. The questionnaire was translated to Persian and was tested on 10 residents, and was then translated back to English by an English-language expert and was tested again on 10 residents. The results were compared and analyzed and the Persian translation was “valid” with Cronbach’s alpha values of 0.76, 0.82, 0.88, 0.79 and 0.92 for clinical scenarios, adherence to guidelines, personal beliefs, preferences and practice sections, respectively. The questions of the questionnaire were classified to five groups: clinical scenarios, adherence to guidelines, personal beliefs, preferences and practice. Then, the medical records of patients in the internal wards were evaluated regarding the status of DVT prophylaxis in the patients, who need prophylaxis. According to ACCP guidelines on DVT prophylaxis in hospitalized individuals, patients admitted to the hospital with Congestive Heart Failure (CHF) or severe respiratory disease, or those confined to bed with one or more additional risk factors, including active cancer, previous venous thromboembolism (VTE), sepsis, acute neurologic disease, or inflammatory bowel disease, require thromboprophylaxis with low molecular-weight heparin (LMWH), low-dose unfractionated heparin (UFH) or fondaparinux (8). In the clinical scenarios section, three clinical cases were described with various DVT risk factors and then the appropriate choice for DVT prophylaxis were asked. The participants themselves filled the questionnaires after brief explanation by the researcher about the goals and methods of the study and confidentiality of the gathered data. The analysis was performed with SPSS version 16 software. The results of descriptive analysis were reported in frequency and percentage form. Statistical significance level for determining correlations between different parameters of the questionnaire was considered as P value < 0.05. The questionnaires were distributed amongst 88 internal medicine residents, and were responded by 71 residents (80.68%). Overall, 28 respondents (39.4%) were first-year residents, while second-year and third-year students comprised 33.8% (24 responders) and 22.5% (16 responders) of the study population. Furthermore, 3 respondents (4.22%) had left their residency year’s field blank. The mean age of participants was 31.90 ± 4.84 years. Only 31 residents (43.7%) were aware of DVT prophylaxis guidelines in hospitalized patients of internal medicine wards. The remaining 40 residents (56.3%) didn’t recognize the presence of DVT prophylaxis guidelines in internal medicine wards. Amongst those, who were aware of those guidelines, only 2 residents (2.81%) rated their knowledge of guidelines as “good”, 21 residents (29.57%) categorized their knowledge of guidelines as “fair” and 8 residents (11.26%) as “weak”. Furthermore, 31 residents (43.7%) declared that they had updated their information of these guidelines within the last 12 months, and 8 residents (11.3%) said that this period was within the recent 3 months, while 27 residents (38%) had updated their information on DVT prophylaxis guidelines more than 12 months ago. Regarding risk factors for DVT prophylaxis, they were asked to choose 1 of 4 choices that is not an indication for initiation of DVT prophylaxis. The answers are shown in Figure 1. There was a wide diversity in residents’ opinions on mortality rate due to pulmonary emboli; 8 residents (11.3%) believed that this rate is 1% while 12, 27, 11 and 8 residents (16.9%, 38%, 15.5% and 11.3%) thought that this rate reaches 2%, 5%, 10% and 20%, respectively. Moreover, 28 residents (39.4%) claimed that the rate of DVT incidence in hospitalized patients is 10 to 20%, while 26 residents (36.6%) thought this rate is 5 to 10%. Only 2 residents (2.8%) thought this rate is less than 1%, and 3 residents (4.2%) said that it is more than 20%. The remaining 7 residents (9.9%) speculated that this rate is 1 to 5%. Residents’ opinions on several statements about DVT prophylaxis is listed in Table 1. In total, 30 residents (42.3%) believed that DVT prophylaxis strongly reduces mortality and morbidity at the hospital while 41 patients (57.7%) rated its effect on morbidity and mortality as “moderate”. Furthermore, 64 residents (90.1%) had prescribed DVT prophylaxis previously while 7 residents (9.9%) didn’t have such experience. Regarding guidelines, 16 residents (22.53%) reported that they routinely used these guidelines while 37 residents (52.11%) reported that they “often” used these guidelines. The most common reasons for avoiding DVT prophylaxis is shown in Figure 2. Finally, 61 residents (85.91%) chose LMWH as the prophylaxis treatment while 10 residents (14.1%) said they chose heparin. Regarding DVT prophylaxis for patients with GFR under 30, 70 residents (98.6%) chose heparin. At the end, three clinical scenarios were described and the approach to DVT prophylaxis was asked. The details are presented in Table 2. 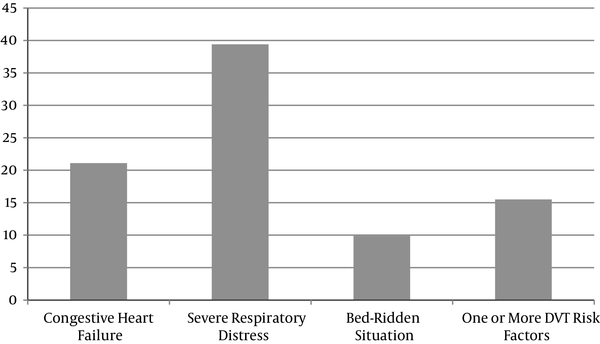 We evaluated medical records of 163 patients, who needed DVT prophylaxis during their hospitalization. In this regard, 139 patients (85.3%) didn’t have any contraindication to DVT prophylaxis while 24 patients (14.7%) had various contraindications. Contraindications included 13 (54.16%) cases of impaired coagulopathy and 11 (45.83%) cases of active bleeding. Furthermore, 4 cases (16.6%) with contraindication for DVT prophylaxis received DVT prophylaxis. On the other hand, only 66.90% of patients, who needed DVT prophylaxis, received these agents. 6 (3.68%) cases of DVT occurred in our patients. Only half of those who developed DVT were receiving DVT prophylaxis already. Further analysis between different components of the questionnaire showed that there is a significant association between “awareness" and “adherence” scores (P = 0.041) and correct answers to “clinical scenarios” and “practice” (P = 0.012). Venous Thromboembolism/DVT is a major problem in the hospitalized patients, which can be easily prevented by simple actions. Guidelines have been designed for DVT prophylaxis but adherence to these guidelines has not been high around the world in various studies. 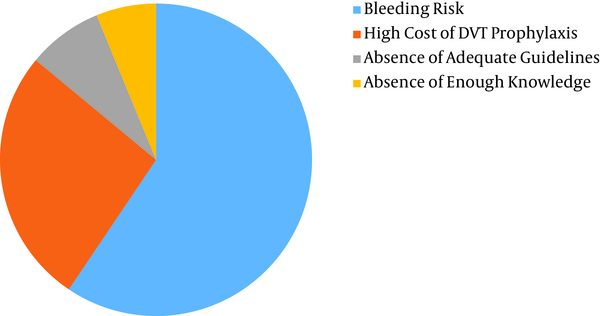 Numerous reasons have been mentioned for this phenomenon but in our study the main drawbacks in residents’ opinions were bleeding risk (53.5%) followed by high cost of DVT prophylaxis (23.9%), absence of adequate guidelines (7%) and low knowledge of resident’s of these guidelines (5.6%). In Vardi’s study (7) the most common reason for deferring treatment was bleeding risk (88.6%) but the second reason was lack of awareness (32.3%), while in our study, this was the fourth reason (5.6%). In another study by Mendoza et al. (9), the pattern of our study was repeated, the first reason was bleeding risk in 82.75% of the participants and the second one was cost of intervention in 41.37% of the participants. In our study, only 43.7% of the participants were aware of the presence of such guidelines in the hospital. Another study (10) revealed that only 27.5% of the participants were unaware of DVT prophylaxis guidelines. Only 2 residents, who were aware of the guidelines, rated their knowledge of guidelines as “Good”. On the other hand, 38% of these residents had updated their information on DVT prophylaxis guidelines, more than 12 months ago. Out-of-date knowledge on DVT prophylaxis in the residents working at the hospital, places the already-endangered patients at a higher risk of DVT occurrence. It seems that there is a need of programs for promotion of knowledge of residents on DVT prophylaxis guidelines. We should note that this study was conducted at an educational hospital, which means that the situation in non-educational hospitals might be worse. Similar studies also showed the same trend in other parts of the world. For example, Vardi et al. (7) reported that most of their participants rated their knowledge of guidelines as “moderate”. The same pattern was repeated in Mendoza et al.’s (9) study, in which most participants reported their knowledge as “moderate” rather than “good”’. In both studies, many had not updated their knowledge on DVT prophylaxis recently. In our study, 90.1% of the participants had prescribed DVT prophylaxis previously; this figure is higher than similar previous studies. Korubo et al. (11) reported that 83.1% of the participants had previously prescribed DVT prophylaxis while this figure in Bhatti’s study was lower and around 63% (12). Without any intervention, the risk of developing DVT in hospitalized patients is 10% - 40%, which is much higher in some groups of patients, such as orthopedic surgery patients (60% - 80%). Almost 10% of all hospital deaths can be attributed to pulmonary embolism (PE). In our study, only 26.8% of the participants thought that the mortality rate due to PE was 10% and higher. Only 39.4% of the participants speculated that DVT incidence in hospitalized patients is higher than 10%. These figures reveal that although 97.2% of the residents believe that DVT prophylaxis is clinically important yet the majority underestimates the prevalence and consequences of these clinical situations in daily practice. Bhatti et al. (12) reported that 98.8% of the participants agreed that DVT prophylaxis is clinically important but 39.4% actually prescribed it themselves. On the other hand, a study by Galbraith et al. (13) among medical residents, surgical residents and hospitalist attendants showed that all three groups had overestimated ideas about the incidence and morbidity of DVT. The evaluation of clinical records of internal wards showed that 66.9% of those who needed prophylaxis received this treatment. In a retrospective investigation of medical records of patients, who developed DVT, it was figured that only 50% of these patients were receiving anticoagulant therapy during their hospitalization. These figures support the idea of underestimation of DVT risk by residents in our study. A study by Zobeiri et al. (14) showed that only 9 patients (3.2%) from a group of high-risk patients for DVT were receiving prophylactic treatments, which is a much worse condition than what was seen in our study. Meanwhile, residents’ level of knowledge on DVT was acceptable. Overall, 83.1% chose LMWH as the standard prophylaxis while 98.6% chose heparin for patients with deranged renal function. Caprini et al.’s study (15) showed that 84% of physicians working in the hospitals preferred LMWH as their DVT treatment of choice. Only 43.7% believed that every hospitalized patient needs DVT prophylaxis unless there is a contraindication. Furthermore, 76% believed that all patients with DVT did not become symptomatic. These correct answers reveal that the knowledge of the residents is acceptable but when it comes to practice, underestimation of DVT risk lowers the quality of medical care and clinical outcomes. Three clinical scenarios were described to evaluate clinical judgment of the participants. In the case with three risk factors, 100% of the participants agreed with initiation of DVT prophylaxis but in the other cases with two risk factors, this rate declined to around 80%. It seems that some residents are not precisely aware of various risk factors of DVT or are not sure about the adequacy of presence of 1 risk factor for beginning DVT prophylaxis treatment. Our study on knowledge, attitudes and beliefs on DVT in residents of internal medicine ward showed that although the level of knowledge on these clinical situations is good, underestimating the risk of DVT in hospitalized patients is a relatively serious problem. This might be due to low levels of awareness of presence and content of DVT prophylaxis guidelines. Structured awareness promotion programs should be designed in hospitals on DVT prophylaxis guidelines. Residents should be informed of the presence of DVT prophylaxis guidelines in the hospital. In order to achieve higher levels of adherence to guidelines, medical records of patients should be investigated to detect cases of incomplete adherence to DVT prophylaxis guidelines. Authors’ Contribution: Study concept and design: Mahbube Ebrahimpur; acquisition of data: Mahnaz Pejman Sani; analysis and interpretation of data: Zeinab Naderpour; drafting of the manuscript: Keivan Goharimoghadam; critical revision of the manuscript for important intellectual content: Mahbube Ebrahimpur; statistical analysis: Zeinab Naderpour; administrative, technical, and material support: Zeinab Naderpour and Mahbube Ebrahimpur; study supervision: Keivan Goharimoghadam.